It's about this time of year that I start getting emails from magazines and websites asking for my food predictions for 2018. I have, to this date, never had a single one of my predictions come true, but that doesn't seem to stop people asking; perhaps it's more about testing my imagination than my soothsaying abilities. Anyway, this year, to avoid the inevitable embarassment of being completely and utterly wrong yet again, I decided to play it safer. With Brexit looming terrifyingly in the distance and London's hospitality industry already in collective terror over whether they'll even have the staff to open next week never mind once half their payroll gets deported, I thought investors would start looking to surer returns on their money, and instead of bankrolling the latest streetfood sensation (be it Korean-Burmese-Eskimo fusion paella or something really stupid) are more likely to want to see 2nd branches of existing successful ventures. We've already seen the start of this in the city, where the brand-new and ludicrously flashy Bloomberg Arcade contains branches of Caravan, Vinoteca, Bleecker burger, Koya, Homeslice and A Wong; all excellent choices, certainly, but safe choices, proven money-spinners that bring their own audience. The owners of 10 Cases on Endell Street could have done exactly that with their second restaurant. 10 Cases is, by anyone's standards, a lovely little place, serving rustic French food for not much money alongside a really interesting selection of wines. Another 10 Cases (in fact, "Another 10 Cases" would have been quite a good name) would, I'm sure, have been just as popular, and just as successful. Instead, just over the road, they've opened Parsons, a seafood restaurant. A very good seafood restaurant. In fact, probably the best seafood restaurant I've had the pleasure of visiting for a very long time, somewhere that approaches the business of serving fish and shellfish alongside an intelligent wine list with such confidence and clarity you wonder why on earth it's taken until 2017 for someone to come up with it. As with so many great ideas, the premise is shockingly simple - get hold of whatever fish and shellfish is best on the day, serve it simply and without fuss, and for a reasonable markup. 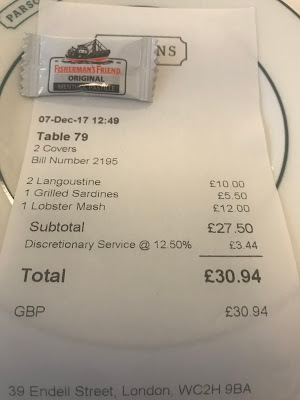 This means that expensive stuff like langoustine and lobster is, well, expensive, but that you can also order cheaper fish for about the price of a pint of beer. And, crucially, whether the raw ingredients are premium or not, they're all treated incredibly well. Take these sardines, £5.50 for the two, simply seasoned and grilled and served with a slice of lemon. The flesh pulled away from the bones beautifully, and had a fantastic meaty, umami-rich flavour. The best grilled sardines take me right back to childhood holidays in Spain, and to Calella de Palafrugell where we'd eat them at whichever beachfront restaurant had a free table. These did exactly that - and for about the same price (in fact probably less). Langoustine were impeccably done - the warm tail flesh pulling out of the shell in one single bright-white piece, the claw meat soft and impossibly sweet. They came dressed in a yuzu-chilli dressing of some kind which livened the meat without overwhelming it - a nice, intelligent cheffy touch. I had to order the lobster mash because, well, come on, you have to order something called "lobster mash" at least once in your life, even if just to say you've tried lobster mash. It was, in all honesty, not quite the divine experience I'd built myself up to expect but was very good nontheless, containing vast chunks of bouncy-fresh lobster and silky-smooth potato. Perhaps it just needed a bit more salt, or a greater amount of butter in the mash, but the bowl was still clean when I'd finished. I appreciate that three dishes isn't a whole lot of evidence to hang an entire restaurant review, but experience tells me that if a place can cook this well once, they can cook it well many more times. And in fact, sneaking glances at dishes going out to other tables I could see that if nothing else the rest of the menu (which includes the odd nod to meat-eaters such as a steak tartare) certainly looks the part. And you don't need to spend quite as much as I did, either. I notice that an entire crab is available for a measly £12 (cutely, hand-painted illustrations of seafood above the kitchen have prices marked next to them if they're in stock), meaning that at £16 the Parsons crab and chips combo (a control variable dish I've used to test many a seafood restaurant) comes in a whole lot cheaper than most other places in town, if not all of them. 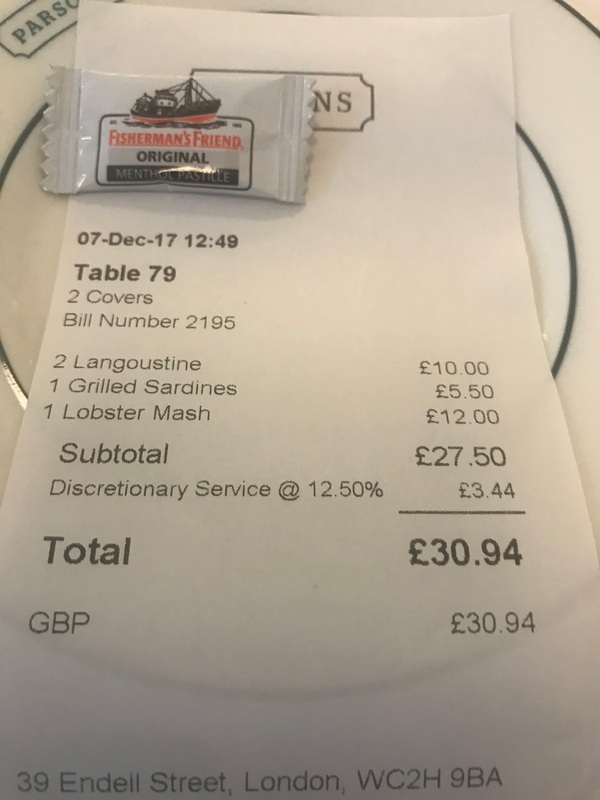 So who knows what 2018 will hold, but whether we end the year on a high, or bartering jewellery for potatoes in Brexit-fueled armageddon, at least we had, for however brief a period, a seafood restaurant in Covent Garden so close to perfect as makes no odds. Hurry up and make the most of it.